In the said meme post, Duterte's face is paste into what Netizens seem to be STO. NIñO. The image you'll see even have a quote saying, "TATAY DIGONG LOVES YOU. He is your only hope and savior." In his Tweet's caption, Paredes said, "I now reject the Son of God from Davao. I believe Duterteronomy as my bible." With this statements, the Apo Hiking Society member got negative response from the concern citizens. Most of them criticized the singer for being disrespectful to their STO. NIñO. 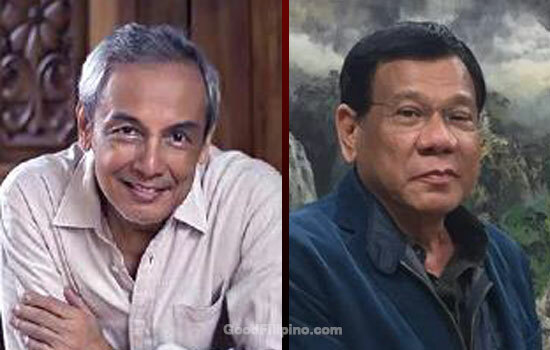 One of the Netizen named @15Jd2(moinkmochi) said, "@Jimparedes if you don't respect Pres. Duterte, you should have at least respect the image of Sto. Niño." But the singer get to explain his side saying, "@15Jd2 To be respected, he must respect others. BTW di lang St Nino ang kulot. Lol. The image was more like the God in 300 Lolololol." "@Jimparedes with that crown, eh Sto. Niño po talaga yan eh. Nakakatanda po kayo, wag nyo naman pong lokohin mga batang gaya ko," moinkmochi said. As we all know, Paredes is an open supporter of Liberal Party's Mar Roxas - Leni Robredo team. And this is also one of the reasons why most responders thought that Paredes has not yet move on since his Presidential bet did not won the highest position in the Government. A certain twitter user named @shielamar11 said, "@Jimparedes move on na tau. Kumnta ka nlng. di Dios ang tingin ng tao kay DU30 sya ang boses ng bayan. Pnalo nmn ang lugaw queen mo. Shutup n."
With this, Paredes responded, "@shilamar11 shut up? Troll ka ba?" The veteran singer's responses on most of the commentators just made the Netizen more enraged. How about you, what are your thoughts on this post? Does Paredes deserve all the hatred his getting? Please do hit on the comment section below. Comments or suggestions about " Paredes on Duterte's meme: 'I now reject the Son of God from Davao'" is important to us, you may share it by using the comment box below.